23rd April is celebrated as the special day of St George, the patron saint of England. He’s one of the most popular of saints, venerated in Romania, parts of Greece, Catalonia and Egypt, among many other places. Perhaps because of our current concerns about nationalism there seem to have been even more articles written and images posted on the internet than ever, many suggesting George is to be celebrated because he is a truly multicultural figure. The actual facts about his life and parentage are confused: he may have originated in Turkey, Syria or even Northern Africa, becoming a Christian martyr when executed for his faith by the Romans. He is associated with Lydda, which is now the town of Lod in Israel. The image of the warrior George as a knight on horseback spearing a dragon became widespread in the medieval period. Shakespeare mentions St George’s role as patron saint of England, most notably in Henry V’s rallying cry before the battle of Agincourt “Cry God for Harry, England and St George”. 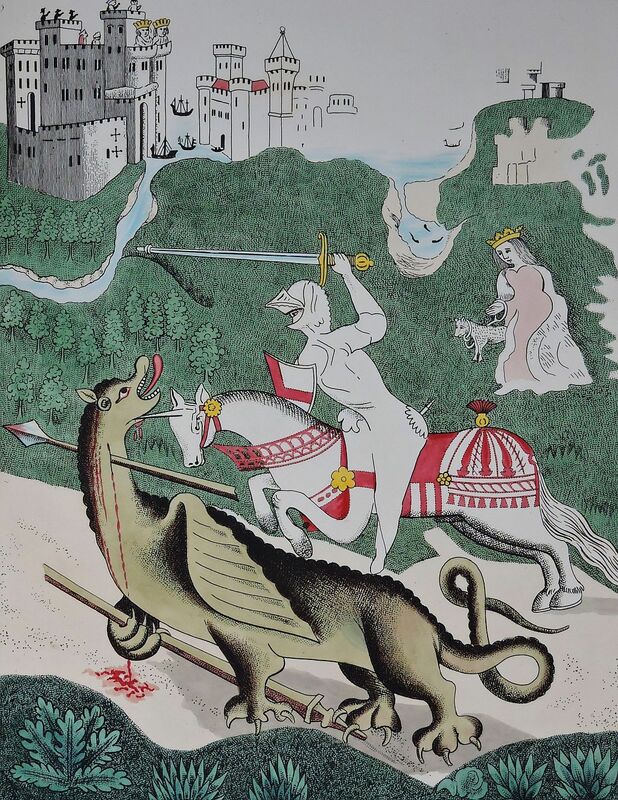 In a recent talk to Stratford-upon-Avon’s Shakespeare Club, Tim Raistrick, the Chairman of the Friends of the Guild Chapel, suggested that Shakespeare may have had his imagination fired by the paintings in the building, which included a magnificent representation of St George and the Dragon. St George and the Dragon in Stratford’s Guild Chapel. From an 1804 drawing. The illustration here comes from an 1838 publication, based on drawings made in 1804 by Thomas Fisher, and sadly does not represent what the paintings look like now, though the Chapel and its newly-restored wall-paintings are very much worth visiting. The wall paintings were placed there around the time the Chapel was largely rebuilt by Sir Hugh Clopton, in 1496. After the Reformation, all paintings in churches were obliterated, and the story has often been told that it was while John Shakespeare, William’s father, was the town’s Chamberlain, that this had been carried out. Crucially this was between 1563 and 1565, too early for William to have seen the paintings. But Tim suggested that at least some of the paintings may have survived for several decades as they are referred to in passing in contemporary documents. It’s a tantalising prospect, but rather a long shot. Several years ago I wrote a post about the chapel before the restoration had taken place. 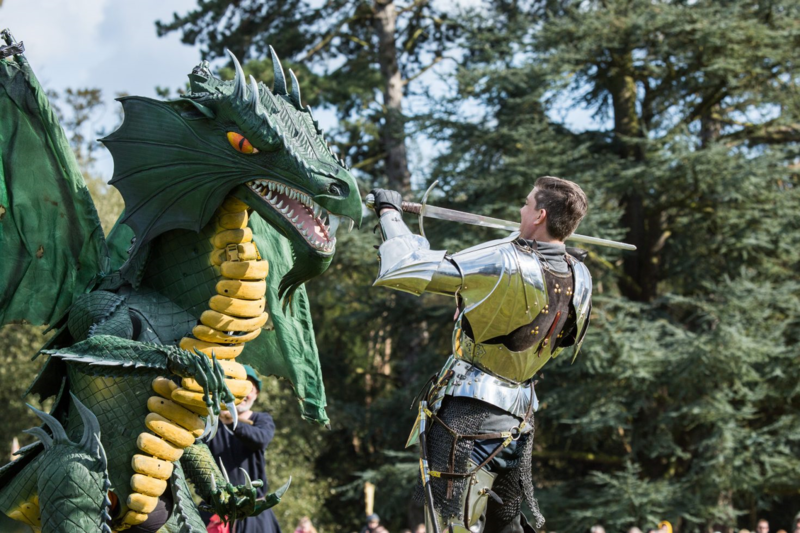 Another possible connection between Shakespeare and St George is through the Ascension Day pageant which took place in Stratford-upon-Avon. In his 1814 Guide to the town local historian Robert Bell Wheler interrupts his description of the Guild Chapel painting of St George with the note ‘There was formerly upon Holy Thursday a procession of St George, whose armour or harness was placed upon one man, and the dragon was borne by another’. For him to mention it some two hundred and fifty years after it last took place it must have been very well-known. There are written references to the pageant and this harness going back to 1541, payments were made for the maintenance of George’s harness and bearing the dragon in 1556, and for the painting of the harness in 1557, when it was also noted that gunpowder was used in the portrayal of this fearsome beast. Then, on the accession of the Protestant Queen Elizabeth in 1558, just a few years before Shakespeare’s birth, the pageant seems to have been abandoned. All was not lost, though, as the harness was stored in the town’s Guild Hall where the rest of the town’s regalia and arms were kept. The Hall was directly below the schoolroom where Shakespeare was educated. Townspeople must have remembered these pageants, and would surely have shown off the harness to the pupils at the school, perhaps even have re-enacted how it was done. 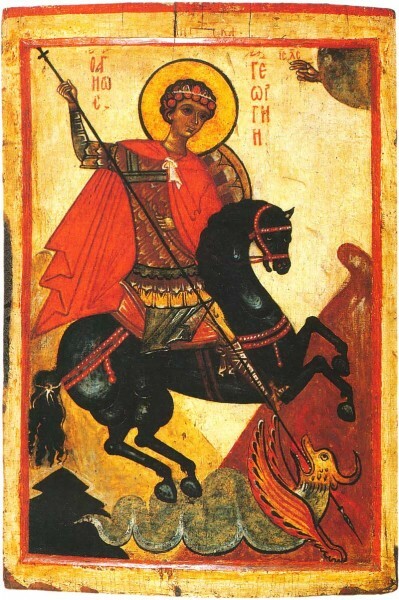 When Stratfordians eventually began to mark Shakespeare’s birthday for themselves, they also made the connection with St George. Stratford was a loyally patriotic town and, with a King George on the throne they immediately made the link between Shakespeare and England’s patron saint. At the first procession of Shakespeare’s characters, in 1827, the procession was led by the figure of St George, in armour and on horseback. Although most of the procession followed the plans set out by Garrick in 1769 (which was aborted because of the weather), St George was an addition. It’s even possible that his inclusion was a reference to those earlier pageants. St George featured again in 1830, this time represented by the upcoming young actor Charles Kean, son of the celebrated Edmund Kean. This 1915 silent film clip from the British Film Institute notes that the Shakespeare Birthday Celebrations, here led by actor-manager Frank Benson, coincided with St George’s Day. Perhaps the connection was made particularly strongly because the Great War was raging at the time. It continues today with Saint George becoming an even more popular figure: this website lists some of the events that took place in 2017 including re-enactments of St George’s battle with the dragon, traditional feasting, and the decoration of Trafalgar Square in red and white. In Stratford, Shakespeare of course is given pride of place, but the flag of St George is flown at the top of Bridge Street and the link is still made between England’s national poet and our patron saint. This entry was posted in Legacy, Shakespeare's World, Stratford-upon-Avon and tagged Charles Kean, Frank Benson, Guild Chapel, Robert Bell Wheler, Shakespeare Birthday Celebrations, St George, St George's Day, Stratford-upon-Avon Shakespeare Club, Tim Raistrick, wall paintings. Bookmark the permalink. Small whinge: not “Sir” Hugh Clopton. I love staring at the dragon’s tail in the Guild Chapel; it’s got the loveliest curl!